God the Father, with a forked bear, wearing a gown and a cloak draped elaborately over his knees, is enthroned in the centre of the panel. Between his knees is the cross, rising from the base of the panel, bearing the figure of Jesus. There is no representation of the Holy Spirit. The symbols of the four evangelists, the winged man of St Matthew, the lion of St Mark, the ox of St Luke and the eagle of St John replace the angels more commonly represented in images of the Holy Trinity. God the Father, with a forked beard and wearing a gown and a cloak draped elaborately over his knees, is enthroned in the centre of the panel, wearing the triple crown, his hands raised in blessing. Between his knees is the cross which rises from the base of the panel, bearing the bearded figure of Christ, his head inclined to the left, wearing the torse and a loincloth. There is no representation of the Holy Spirit. Three souls are represented by diminutive heads and shoulders in a napkin at the top of the cross. A chalice receiving the blood flowing from Christ's feet is represented at the base of the cross with two more receiving the blood from his hands at the side of the panel. The blood is represented by thin strips of alabaster. The symbols of the four evangelists are carved in the corners of the panel. At the top left, standing on a bracket, is the eagle of St. John. Opposite is a man on a bracket, representing St. Matthew. At the bottom left stands the ox of St. Luke, with the lion of St. Mark on the right. The three beasts and the man are represented as winged. They all bear scrolls, the inscriptions now lost, but they were doubtless the names of the four evangelists. The heads of the two outer souls in the napkin are missing. The top corners of the panel are missing. Some green paint and traces of the usual daisy pattern remain on the ground. Traces of brown paint and gilding remain on the crown, hair and beard of God the Father. The back of the panel is marked in an apparently random zigzag fashion. There are three lead-plugged holes with latten wires attached. The bottom has been cut away. Historical significance: This panel and A.1-1952 are the only two recorded alabaster altarpiece panels of the Trinity which include the symbols of the Evangelists, although there is an alabaster panel in the Walters Art Museum, Baltimore, which appears to be one end of a tomb chest, of the Trinity in a mandorla with the Four Evangelists outside the mandorla. Alabaster panel depicting the Trinity with symbols of the four Evangelists. English, second half of 15th century. Hildburgh, W.L. 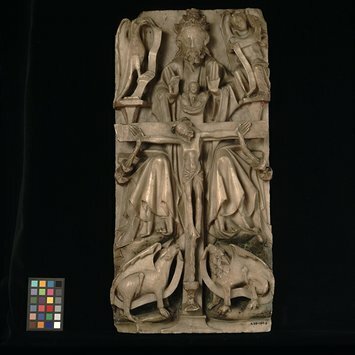 Notes on some English Medieval Alabaster Carvings. Antiquaries Journal. III, 1923, pp. 28-9, pl. VII, 1. Victoria and Albert Museum. A Picture Book of English Alabaster Carvings, 1925, illus. no. 15. Victoria and Albert Museum. English Medieval Art (exhibition catalogue), 1930, no. 675. Hildburgh, W.L. Iconographical Peculiarities in English Medieval Alabaster Carving. Folk-Lore. XLIV, 1933, pp. 50-1, pl. IV, fig. 9. Burlington Fine Arts Club. Exhibition Catalogue, 1939. no. 129. Hildburgh, W.L. Studies in Medieval English Alabaster Carvings--I: Six Tables at Daroca;--II: A Table of the Holy Trinity. Journal of the British Archaeological Association. XVII, 1954, p. 22.